This site is a preview of some notable historic sites in Northeast Tennessee. This is my first post to this site in a little more than three years. Originally, this site was created as part of a college course requirement. I’ve neglected the site since the class but now I’m back. Hopefully, I’ll have time to post other interesting history pieces to this page as time permits. If you’ve been following in hopes of new content, perhaps the next few months will satisfy. Maybe I’ll talk about the Civil War, the Depression in Appalachia or simply visit a few unique places you can find in Northeast Tennessee. Oak Hill Cemetery is located almost exactly in the middle of Johnson City, Tenn., and contains the graves of several notable Tennesseans. 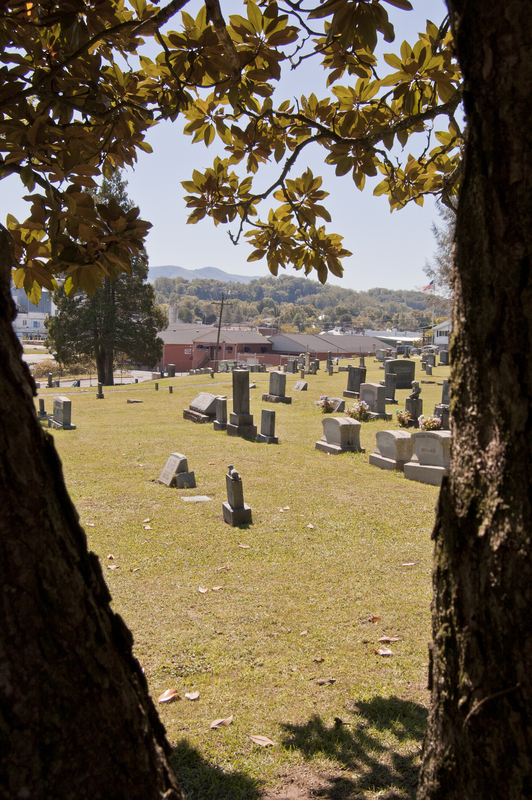 This cemetery has been around as long as Johnson City has. Johnson City was formally established in 1869 by Henry Johnson. The cemetery was declared the next year. Henry Johnson and his wife are buried there. Johnson established a train depot near what is now downtown Johnson City and the settlement became known as Johnson’s Depot. Prior to that a small village near the site was known as Blue Plum. Perhaps the most notable grave in this cemetery is that of Col. LeRoy Reeves, the designer of the Tennessee state flag. According to a historic marker placed in the middle of the graveyard, Reeves’ design was chosen by the state legislature as the official Tennessee flag in 1905. It was first raised in a ceremony dedicating East Tennessee State Normal School – now East Tennessee State University – Oct. 10, 1911. Reeves died in 1960. 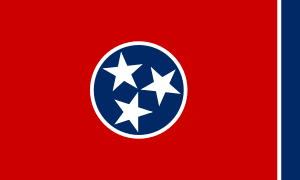 For anyone who may not know what Tennessee’s flag looks like, I’ve included an image below. The three stars represent the three divisions of the state – East, Middle and West. Many graves in Oak Hill Cemetery date from the 1800s. 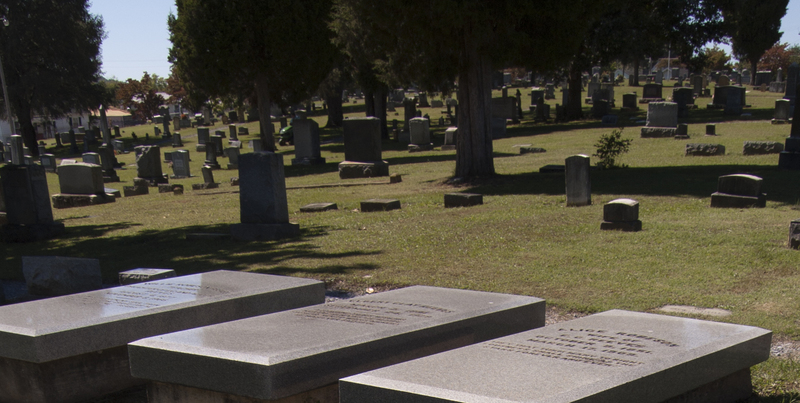 The cemetery still operates today. The top picture accompanying this blog was taken by me at the east end of the cemetery looking south, toward Buffalo Mountain. I framed the shot looking through tree trunks. The next picture shows some of the Reeves family graves at the bottom of the picture and other tombstones in the background. For more information on this cemetery and much more Johnson City’s history, I recommend checking out the Johnson’s Depot website. It covers pretty much the entire history of Johnson City. President Andrew Johnson, America’s 17th head of state, is buried in Greeneville, Tenn. He also lived there for most of his life. Today, people can tour his Greeneville home and also see where he is buried – at Andrew Johnson National Cemetery, also in Greeneville. Johnson became president in 1865, following the assassination of President Abraham Lincoln. He was impeached by Congress because of his reluctance to punish the South for the Civil War. He was not removed from office, though. I have provided a short video that gives a brief tour of the historic site below. Enjoy. Today, visitors to his home can get tours and, as a fun activity, also participate in a yearly vote to impeach Johnson. These are tallied and published each year. Tours of the home also include a display of his tailor shop and a film on the president. A museum on the grounds offers a more in depth account of his impeachment trial and visitors can also see his grave in the national cemetery. For more information on the historic site click here. The Museum at Mountain Home boasts some elaborate displays of medical implements and devices from decades past. If you read one of my previous posts on the museum, then you know about the military history portion of this museum and the museum itself, so I’ll not spend more time on that. If you don’t know about this museum, see the post before this one. The museum collections reflect the history of health care in South Central Appalachia with exhibits of late 19th and early 20th century medical, pharmaceutical and nursing artifacts. I snapped several pictures of an iron lung, a doctor’s case full of bottles and devices and an ancient-looking optometrist’s chair. The tour guide suspected the manufacturer of the chair also made barbershop chairs, because both were similar. A typical doctor’s office from Knoxville dating to the early part of the 20th century is laid out with a mannequin of the doctor about to perform a procedure. To learn more about the museum visit click here. 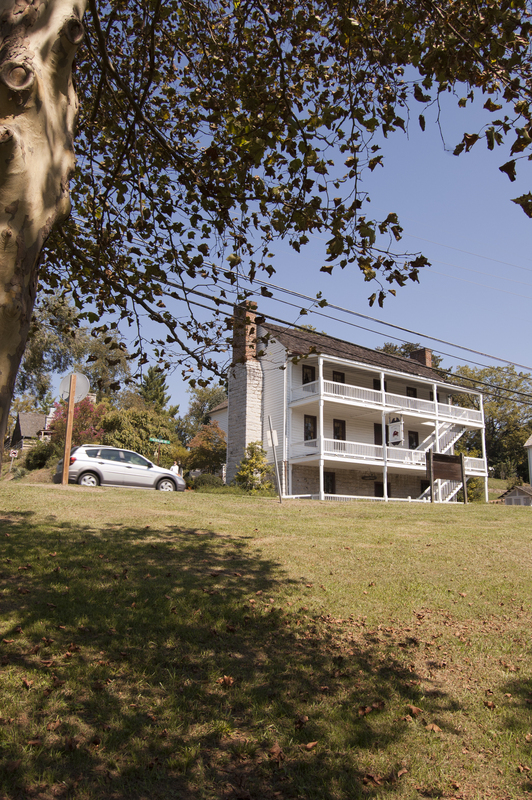 The Netherland Inn is located in Kingsport, Tenn., and has been around since the early 1800s, however, settlers began utilizing the site prior to the Revolutionary War. who purchased a stage coach contract to drive business to his new inn. The road on which the inn sits became the main rout to all areas west, so it probably saw a lot of travelers. 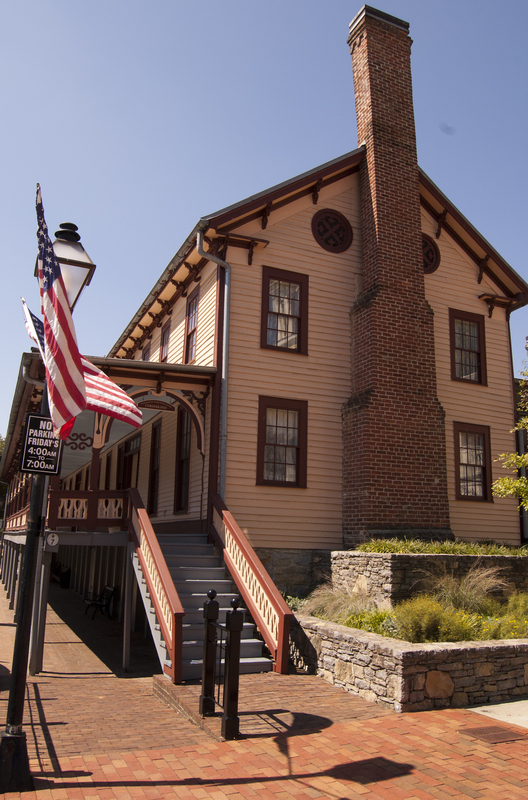 We are certain that presidents Andrew Jackson, Andrew Johnson and James Polk stayed at the inn. I grew up in Kingsport and remember hearing that George Washington stayed there. I can not confirm that right now, but there was certainly activity at the site during his lifetime. The inn sits along the banks of the Holston River, and in about 1802 a man named William King established a boatyard there to provide transportation for his salt business. This is where Kingsport gets its name. The boatyard was actually operating by 1768, according to the historic marker on the site. It served as the hub for most commercial and immigration activity on the Holston until about 1850. In 1979, a local Boy Scout troop erected on the site a replica of a flatboat that would have been commonly used by settlers in the late 1700s. 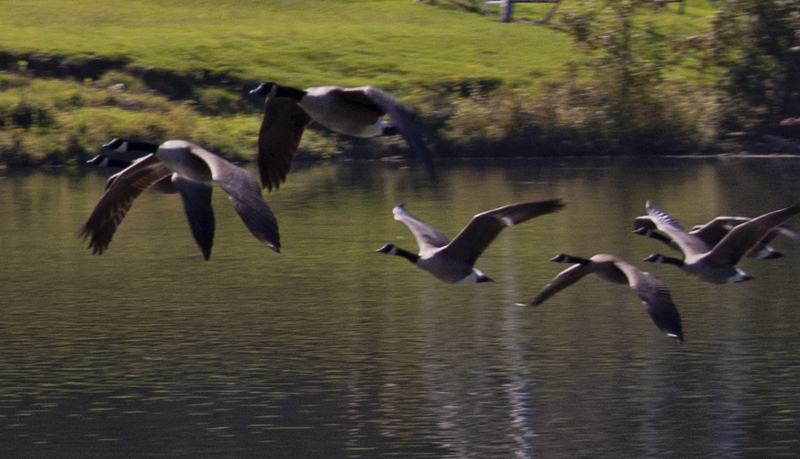 I took this shot of these birds flying while walking near the inn. The shot is not necessarily historic in nature, but you will see this kind of thing if you visit the inn. In fact, you don’t have to visit the inn at all, because a walking trail and park spans a good length of the Holston on either side of the inn. I was walking on the trail when I took this picture of the birds. The inn is a museum now and is open for tours. Visit the website for more information. A neat local museum offering lots of interesting exhibits is The Museum at Mountain Home. I wrote about the Veterans Affairs Medical Center, Mountain Home, campus a few weeks ago. I mentioned there was a museum on the grounds that contained medical history. Since then I was invited to tour the museum and write a story for the Johnson City Press. This story focused on the military history side of the museum and that is what I will focus on briefly in this posting today. The military history part of the museum features memorabilia from every conflict America has been involved in since the beginning of the 20th century. A mess kit from World War I is displayed, along with a mannequin wearing a period U.S. Army uniform. An extensive collection of U.S. Navy photos is also arranged in the museum, and you can read more about those by clicking on the link to my story above. The military portion of the museum is still growing, so I’ll leave today’s post fairly short so as not to reveal too much about the exhibits; however, I will mention that a large display about the battleship USS Arizona in this museum is really interesting. The museum is usually only open Tuesdays and Thursdays from 9 to 11 a.m. and Wednesdays from 1:30 to 3:30 p.m. However, special open houses will be held Saturdays through Nov. 6 from 1 to 4 p.m. A final open house will be held Veterans Day, Nov. 11, from 9 a.m. – 4 p.m. The museum is located on the VA campus in Building 34, also known as the clock tower. Visit the museum website here. A note on these pictures: I took them while on assignment for the Johnson City Press. I’ll focus a little on the medical side of the museum of this unique museum in a later post. In Greene County is a state park dedicated to David Crockett, or Davy Crockett as he is commonly referred to. This man was an influential figure in early American history. He was a state legislator, congressman, soldier and frontiersman, among other things. He was sort of a popular icon during his life and his legend only grew after his death. I’ve included a really informative video on Davy Crockett and his life below. In fact, Davy Crockett is perhaps best know for dying at the Battle of the Alamo in the Texas Revolution in 1836. This famous battle is where a popular phrase arose – “Remember the Alamo.” You can still hear variations of this phrase today, the most recent being “Remember 9/11,” a reference to the terrorist attacks of Sept. 11, 2001. Anyway, Davy Crockett’s birthplace along the banks of the Nolichucky River in Greene County is preserved, for the most part, for everyone to enjoy. This state park includes a museum, campground, picnic area, fishing area and a recreation of the log cabin that Davy Crockett was most likely born in. I actually have visited this park to write a feature story about a re-enactment held there for the Johnson City Press. Re-enactments are held periodically at this site and visitors are welcome year-round. Below are directions to and contact information for the park. I have just a little more information to share with everyone about Sycamore Shoals State Historic Area. Besides being a mustering point for the militia of Overmountain Men prior to the Battle of Kings Mountain in 1780, the site is also famous for several other reasons. The first such reason is that the site is considered the first place of free and independent government west of the Appalachian Mountains through the “Watauga Association.” Most of Northeast Tennessee is in an area known as the Watauga River Valley, which is where the “Watauga Association” took its name. Anyway, the association was formed in 1772. Besides being the site of the first democratic government outside the original 13 colonies, Sycamore Shoals is also the spot where the Transylvania Purchase was made in 1775. This deal saw settlers buying 20 million acres of land from the Cherokee Indians for around 10,000 English pounds. Less than a year later the Cherokee with help from the English began attacking the settlers to drive them from this land. 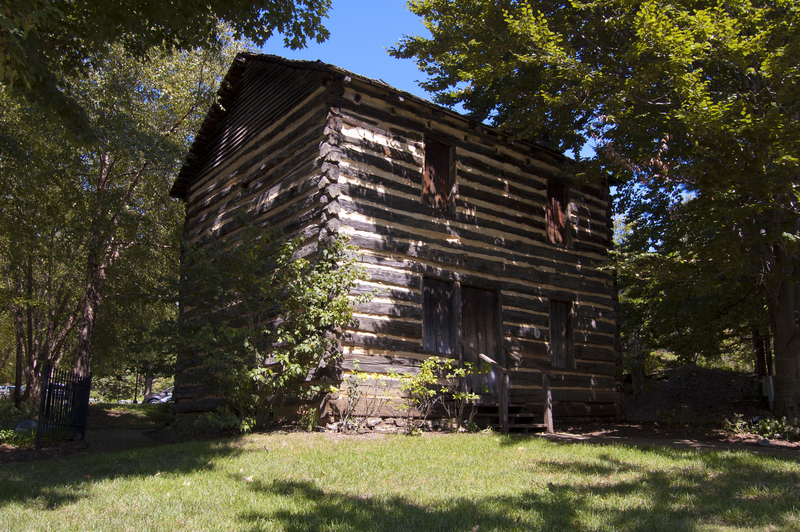 For additional information on Sycamore Shoals and its historic significance to the nation, visit the website at http://www.sycamoreshoalstn.org/. Regarding the pictures on this post: I shot these with my Nikon D50 on Sept. 25. 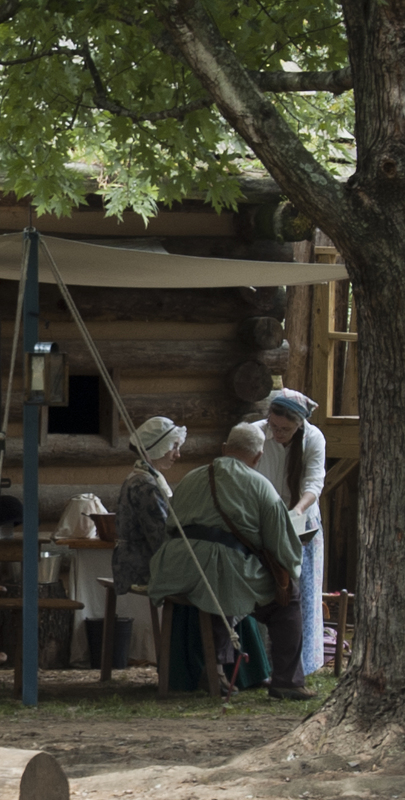 The top picture shows re-enactors working outside a log cabin located inside a recreation of Fort Watauga at Sycamore Shoals. 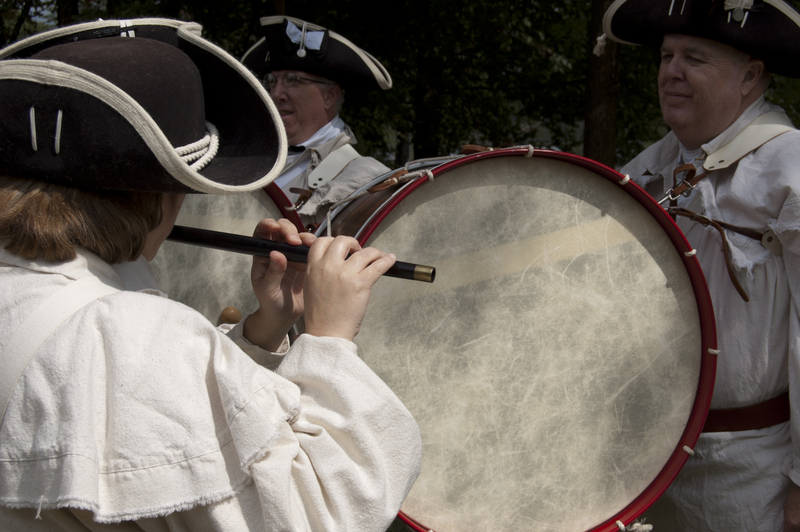 The picture at the bottom is of a group of traveling re-enactors who portray a colonial-era marching band. They played lively marching tunes as the Overmountain Men re-enactors waded across the Watauga River’s shoals for the 230th anniversary of the muster at Sycamore Shoals (See earlier posts for more information about the muster). 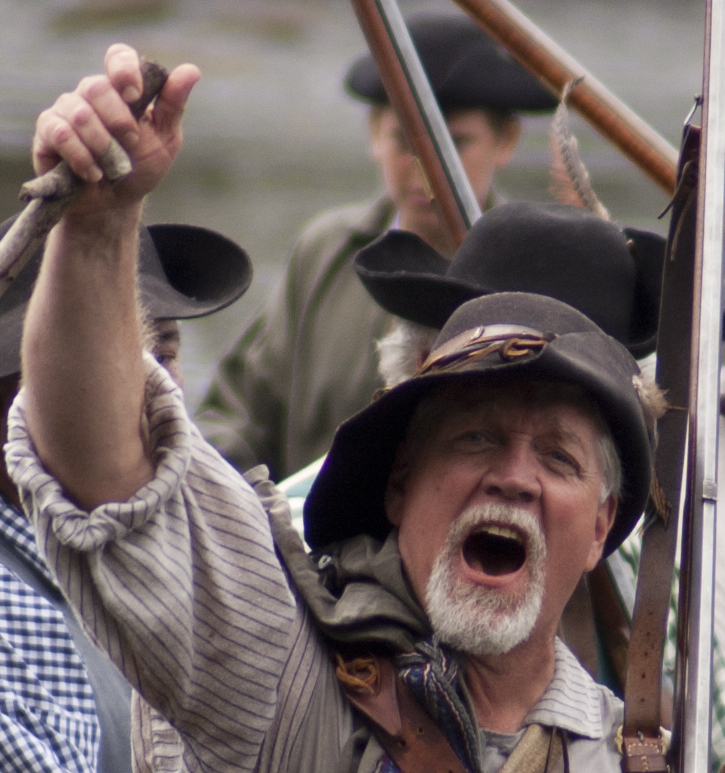 For this podcast I interviewed several people at Sycamore Shoals State Historic Area on the 230th anniversary of the muster of Overmountain Men. Many people were there that day and I got some good information. See my previous posting for more information about the Overmountain Men, or simply listen to the podcast. The guitar piece accompanying the podcast is called Travel Light and was performed by Jason Shaw. I pulled the music from his website at audionautix.com. I narrated the podcast myself. The top picture was cropped from a larger image of about a dozen men who crossed the Watauga River at a shallow point known as the shoals. 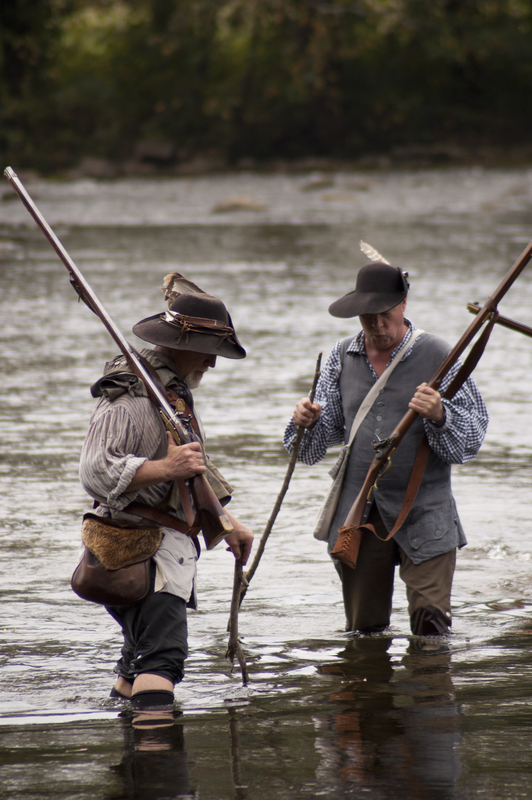 They were recreating the original crossing of 400 Virginians from Abingdon, Va., in 1780 who met another militia at Fort Watauga, which is where Sycamore Shoals State Historic Area is located. I’ve also included below the route the Overmountain men took. That route is now a historic trail created by Congress in 1980. The trail is actually in the shape of a “Y.” In reality, men from all over this area met up with the Overmountain Men as they marched, so there were many small feeder trails, so to speak. Listen to the podcast for more information on the trail. 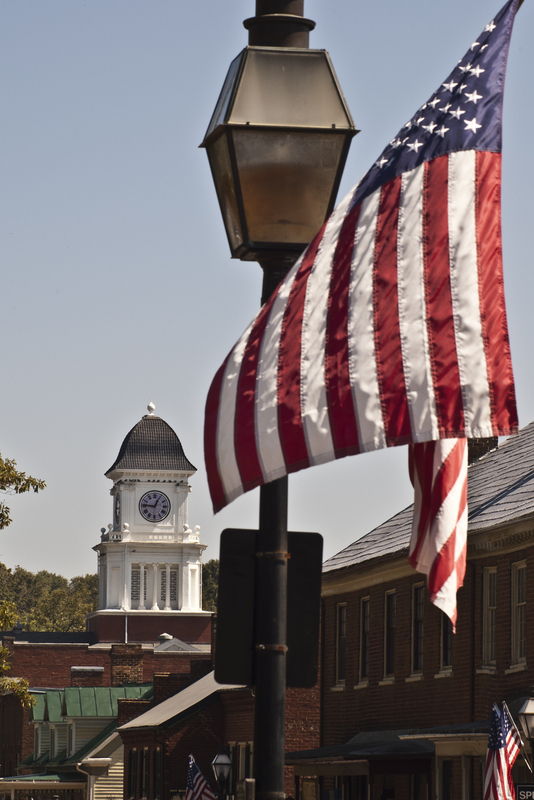 This weekend in Jonesborough will be the 38th annual National Storytelling Festival. The small town will be packed with at least 10,000 extra people. And in addition to hearing tales spun from the mouths of professional storytellers, audiences will be privy to some interesting local history, as well. And you, dear readers, will be privy to that same history today. The first item of interest is the Christopher Taylor House. This house was built by Christopher Taylor in 1777. 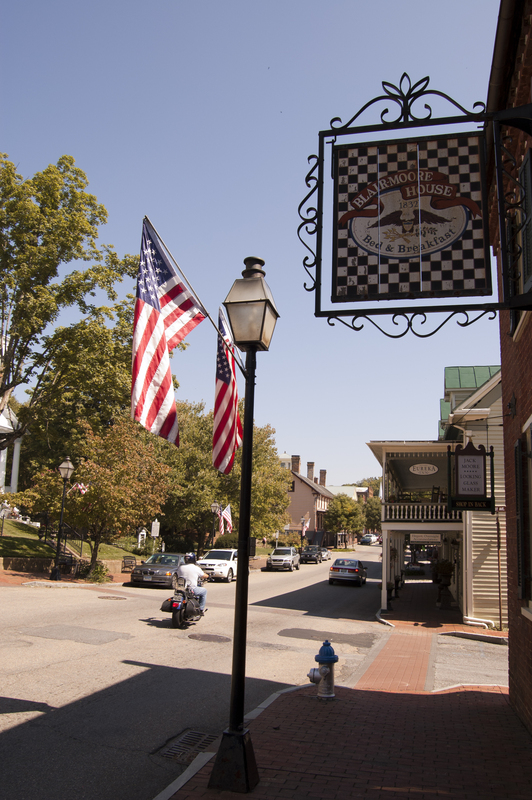 It now sits on Main Street, Jonesborough, but was actually moved there in the 1970s. Taylor was an officer in both the French and Indian War and the American Revolution. Andrew Jackson, the seventh president of the United States lived in Taylor’s home while he practiced law in Jonesborough. The next point of interest on today’s stop in Jonesborough is the Chester Inn. This Inn has continuously been occupied as a place of lodging since it was built in 1797 by William P. Chester of Lancaster, Penn. President Jackson stayed at the inn, as did James K. Polk and Andrew Johnson, the 11th and 17th presidents, respectively. One other stop in Jonesborough is the Blair-Moore House Bed & Breakfast. I don’t personally know much about this location, except that, according to the vintage-looking sign attached to the front of the building, it was established in 1832. I liked the look of the sign and the American flags on the lamp post flapping in the wind when I took this shot you see below. I think the whole scene comes together very nicely. Some of my HST collection. Mary Jane Young, nee Mayleben, 96, died peacefully at home on Wednesday, April 24, 2019.